Introducing Yummy 3.1, the first feature update of Yummy since the completely new version 3 first hit the App Store earlier this year. It’s currently with Apple for review and should be available to download in a week or so. Let’s talk about those features in more detail. You can ask Pinboard or Delicious for suggestions when you’re creating or editing a bookmark; you can filter bookmarks (by date, shared/private, to read) and tags (number of bookmarks) and sort (alphabetically, chronologically, by tag count). The speed of modern hardware make these options possible when they were not when Yummy was first written. 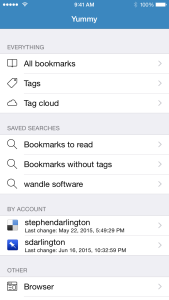 Saved search is a popular feature that was in Yummy 2.x but didn’t make the cut for 3.0. It’s back in 3.1 and it better than ever. It now syncs between your devices using iCloud. If you flag a search as a “Favourite” then it will appear on the home screen ready for quick access. As ever, there are a lot of other, smaller features that I won’t get into here. It’s a pretty big update for a “0.1”. We hope you like it.